On April 2, 1917, US President Wilson met with a joint session of the US Congress. He requested a declaration of war against the Central Powers. This request was a long time coming. The war in Europe had started in 1914. The Germans had sunk the passenger ship, the Lusitania, in 1915, with over 100 American passengers on board. Germany was conducting unrestricted submarine warfare, using their U-Boats, their submarines, to sink merchant ships and freighters, some of which were manned by Americans. Wilson had asked Congress to let him arm merchant ships and freighters, but they had refused. Wilson used his presidential powers to arm these ships anyway against "piracy." But still, German U-Boats continued to sink ships in unrestricted warfare. In April 1917, Congress finally agreed to come into the war on the side of the Allies. Why did it take America so long to join the war effort? Nobody wanted to get involved, not the American public, not the US Congress, and not US President Woodrow Wilson. But America was affected by the war. American industry realized great profit through the production and sale of tanks, bullets, uniforms, and other materials needed to fight the war. 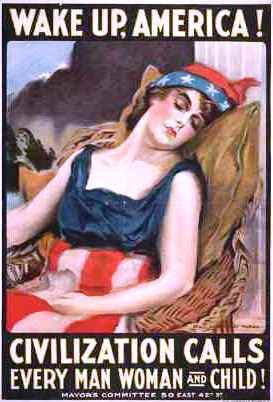 The American people were affected by war propaganda posters. The Zimmermann Telegram: Germany was worried because of potentially increased profits and effective war propaganda that the United States might join the war effort on the side of the Allies. Germany knew if America entered the war, Germany would be in trouble. Germany was tired. They had been fighting a bloody war for three years. They did not want a new enemy, especially not one with a strong army. Germany sent a telegram to their representative in Mexico. This telegram became known as the Zimmermann telegram. This telegram directed their representative, Zimmermann, to work in secret negotiation with Mexican officials to get Mexico to agree to declare war on the United States if the United States declared war on Germany. Germany was willing to make many concessions. They offered Mexico land and money. After all, Mexico had been at war with the United States before, in the Mexican-American War, a war that ended 1848 with an American victory. This time, with Germany's help, Mexico could get back all the territory they had lost in that war. But Mexico said no. The Zimmermann telegram was intercepted by the British in Jan 1917. The British did not immediately share this telegram with the United States. There had been talk between Britain and the United States about a possible American entry into the war, but nothing had been firmed. Britain was concerned that America would not enter the war if they thought Mexico might create a conflict along the US-Mexican border. They decided finally to share it with President Wilson. Wilson released this telegram to the US press. It was published across the US in American newspapers on March 1, 1917. Americans have never taken threats well. The contents of this telegram swayed public opinion against Germany. By April 6, 1917, Congress had approved Wilson's request to declare war. General Pershing and the AEF: Congress put General "Black Jack" Pershing in charge of American soldiers to fight overseas in World War I. Pershing would not allow American troops to be mingled with troops from other countries. He insisted that American troops fight in American units only. The AEF, or the American Expeditionary Force, was the name given to the American soldiers who went to serve in Europe during WWI. The AEF was a separate force under General PErshing and not part of the French or English armies. That was a good thing. Pershing did not like the new technique of trench warfare. He preferred open warfare. He did not believe American troops were prepared to fight a more modern war. They had no experience with modern weapons or modern tactics. Americans had not fought a war in decades. Pershing finally agreed to coalition, working together with other countries as a team, but only on the upper levels of command. He stood firm that American units, the AEF, would be directed by American officers in the field. America had a very small army in 1917. Our army was smaller than the army of Belgium. But we had a lot of men available to join the army. By June 1918, there were over a million Americans fighting in Europe, under the direction of General Pershing, although only about half fought on the front line. Pershing was a very capable general. His troops, the AEF, became known as "The Doughboys". Germany Surrenders: By Nov 1918, Germany had surrendered. All nations, including the United States, agreed to stop fighting while the terms of peace were negotiated.